Teacher of Art and Design. Established art studios, Tallinn Estonia. Founder/ Chairman/ Trustee. Saint Etheldreda Art Studio, Norwich. Norwich School of Art and Design B.A. Fine Art (Honours) Sculpture. University of Brighton P.G.C.E. Art and Design. DFEE registered teacher. 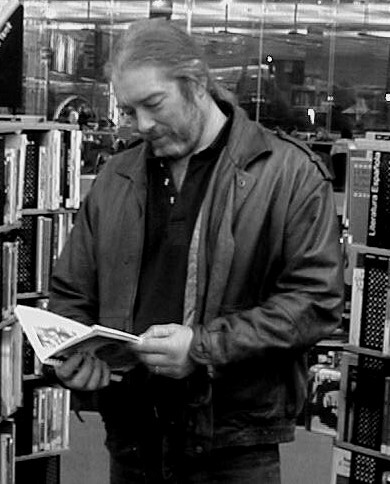 Mick Sanderson has exhibited and worked internationally. Mick’s' early work was self expressive, searching for a creative tangible (practical) and philosophical artistic 'truth'. Artwork at that time was relatively abstract (one series of work was completely organic) but as he moved into using stone (MS Archive) it developed a figurative bias. Stone sculpture was all direct carved - no model or drawings were used. The carvings weighed between 20 - 3000kgs. The limitations of creating sculpture in stone eventually led Mick to work on maquettes and in bronze. Mick feels that his depth of knowledge and experience means that he is now versatile enough to work with concepts and designs that reflect the qualities inherent in a wide range of media. Mick has always been concerned to create sculpture 'in the round' - to be appreciated from all sides. He has always been aware that high quality sculpture has a particular identity and has always attempted to develop concepts in his work to explore this fact. Simply to reproduce (model) elements from life are not an option. Creating successful work like this meant understanding how to use balanced form - to create sculpture in which forms move fluidly from one area to another without interference or unsympathetic breaks. Mick has found the use of sporting figures in sculpture has allowed him to develop and improve on his previous experiences of using balanced forms in his artwork. Working from the living figure (human and animal) bounded with moving muscle and sculpted on a scaffold like skeleton, is the ultimate challenge in delivering a holistic and exciting three dimensional artwork. While Mick’s work now is currently based on ideas generated from sport, sporting icons and the portrayal of dynamic movement in sculpture he is happy to create work using individual preferences or themes.